I think I grew up in the first generation to really be a part of the mass distribution of "participation awards". I was a soccer player from the time I was 4 1/2 until the time I graduated high school. I have a distinct memory of sitting on the front walkway of these apartments where we lived when I was maybe 5 or 6 years old, and lining up my soccer trophies so that anyone who walked by could see them. And you know what? I was SO proud of them. I really was. When I first started playing soccer, I was a hysterical, crying mess. But my parents kept taking me and I eventually fell in love with the sport. And each and every year, I received another trophy. They were cool, but I stopped caring so much about them over time. By high school, soccer trophies just for showing up had ceased, but I now had shelves full of look-alike trophies from my younger years. They began to lose their awesomeness, and I cared about them less and less. Medals began to show up now, which we only received when we placed well in tournaments. These were special to me. High school soccer seasons ended with awards for "top scorer" or "most inspirational" or "best whatever", none of which ever seemed to grace my hands. But that was okay, and it didn't disappoint me, and I had learned to be sincerely happy for those who did receive them. When I finished high school and got married, I left my trophies behind for my parents to deal with. I'm sure they got rid of them, and I certainly don't care that they did. I hung onto a couple paper awards that I was especially fond of from academic achievements, but otherwise, I let it all go (it's important to note that I'm totally a minimalist and in no way, shape, or form am I sentimental). Fast forward to having kids of my own. As a new mom who knew every thing about parenting (ha! ), not letting my kids have participation awards was up there with never homeschooling (we all know how that turned out). Buuuuut.....I found that for my little 5 year olds trying out a new sport for the first time, a trophy or medal at the end of the season made their little hearts so dang happy. 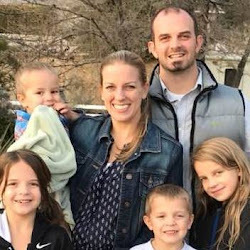 And there was no way in hell that I'd ever tell them it didn't mean anything other than they showed up and played soccer for a full season. Heck-they rocked it. Tried something new. Got over their fears. Got hit in the face with a ball. They totally needed that cheap little trophy at the end of the season. But now I have a child who is actually competing in a sport. Ellie is 9 and just finished her second gymnastics meet. 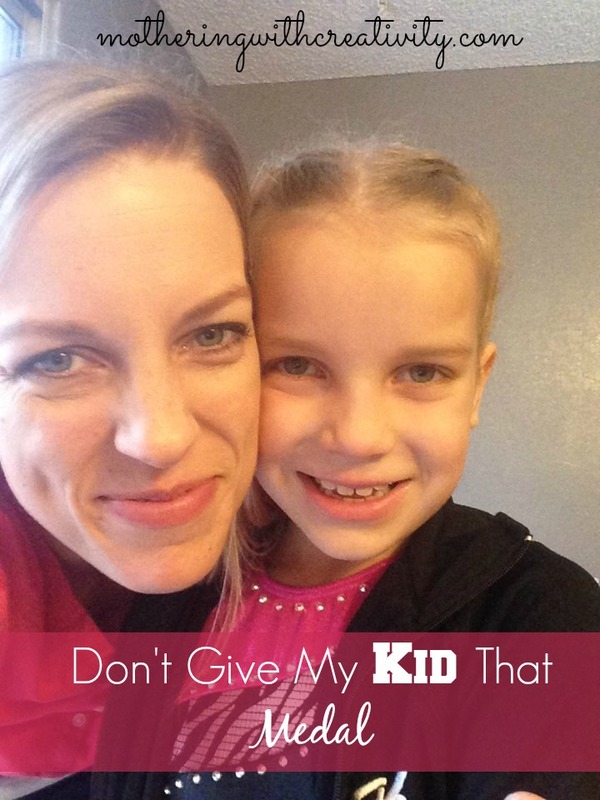 I find myself back at the "don't give my kid a medal just for showing up" place once again. This is not a recreational gig, this is a competition. We greatly focus in our home on just doing your best. Whether you "win" or "lose", you do your best. Beat you score from last time. Nail something that you were unsteady on last time. Cheer on your teammates, and smile even if you don't get called up for an award. Competition #1- She did it! 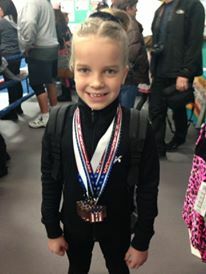 Ellie's first competition was met with medals for every place. If there were 9 girls in a division, they placed each event up to the 9th place. And so, Ellie received 5 medals, even though two of them were last or second to last place. But this was her first competition, and we were so proud of her for going out and doing it (and heck-she had to compete against 13 year olds for some reason). We never even mentioned to her that some of those medals were technically last place. But she knew. She even mentioned it to us after a few days. And I wondered if her medals were worth slightly less in her mind now that she figured out that everyone got one no matter what. But of course I didn't ask her about it. Competition number 2 was this weekend, and while the podium was a large one (up to 8th place), they did NOT give participation medals. You either earned your way up there or you didn't. And I was so relieved. No parent wants their kid to miss out on earning a medal in a situation like this, but at the same time, I am the parent who doesn't want my kid to get one just for showing up. When everyone gets a medal in a competition, it devalues the medals that were actually earned. The kids who receive the "last place" medals know that they just got last place. I want my child to know that if she earns an award/medal/trophy that it has meaning and value. I want my child to know that sometimes we try our hardest and still don't "win" anything. And that's okay. 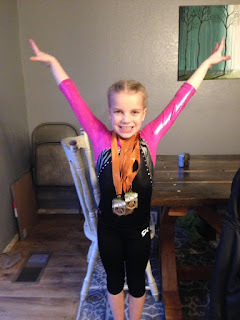 I want my child to find value in her accomplishments outside of just getting a medal, and to feel a sense of pride in her work, regardless of what anyone else might say. Ellie mentioned how these medals were cooler because she earned them. She totally gets what's going on. So don't give my kid that medal. If she earns it, go for it. But if it's for last place, please don't. She'll be fine even if she doesn't get one. Because in her words, "I'm proud of myself because I overcame my anxiety and fears about competing and I did it...even though I got last place in that event!"